Our previous two guides were on how to install Apache Hadoop and how to install Apache Spark. Next step technically is to get data from source like server log files. Here is How To Install fluentd Agent on Ubuntu 16.04 As Intermediate Step of Log Data Collection For Hadoop. We Can Receive Data on Laptop. This step is on your servers to monitor, not on other servers. It is a beautiful software written in Ruby. 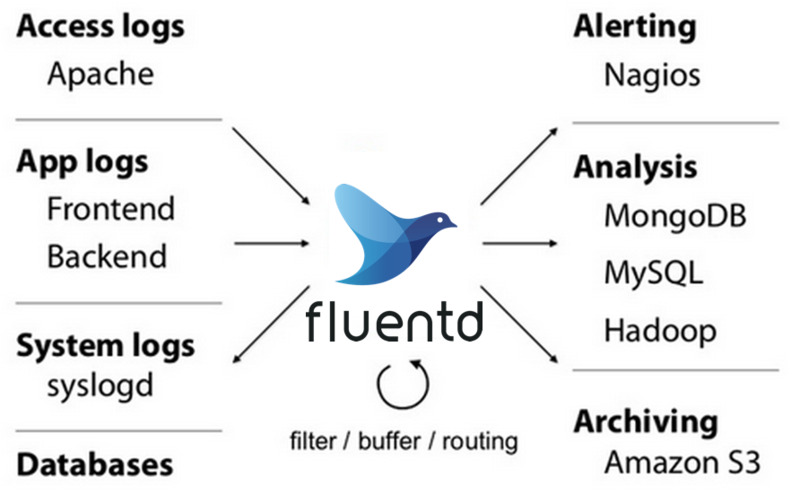 Fluentd is a Big Data tool and can work with unstructured data in real time. Exactly like an another tool Kafka, it analyzes the event logs, application logs, and clickstreams. It can simply output the collected data over HTTPS with settings to secure the transport. It is better to get used with the usage of such tools before jumping to analyse data with Apache Hadoop, Spark or plain Elastic Search. You must not use the public IP of the web server associated with domain under question for higher security except for debugging, initial setup etc. Server running Big Data Specific tool like Apache Hadoop, Spark alone or in combination. Server running primarily basic analysis tools like ElasticSearch rather ELK Stack. Server running Big Data Specific tool like Apache Hadoop, Spark alone or in combination and ElasticSearch and Kibana. This way of learning will help you to never fumble with – “will I use ElasticSearch or Apache Hadoop?”. Elastic analytics stack is gaining popularity for various reasons. ElasticSearch uses JSON based query language which is much easier to master than Hadoop’s MapReduce. Also the Developers are more comfortable maintaining ElasticSearch instance over Hadoop. Of course, this architecture would have data loss issue on the ElasticSearch side. You need Treasure Data in such case in front of ElasticSearch to “buffer” it. We are simply using fluentd to maintain backward and forward compatibility without disturbing the main server too much. Where there’s a shell, there is a way. The way is for the hackers too. log-ip is your log server ip, 24224 is your port. This Article Has Been Shared 8756 Times! Cloud Sound and Cloud Music Technologies are one of the hottest technologies on discussion right now. In this article we have focused on the basic offerings of Cloud Sound and Cloud Music Technologies. Cite this article as: Abhishek Ghosh, "Install fluentd Agent : Log Data Collection For Hadoop," in The Customize Windows, January 23, 2017, April 21, 2019, https://thecustomizewindows.com/2017/01/install-fluentd-agent-log-data-collection-for-hadoop/.